Bernhard will talk about the basics of Free Software to why Free Software is important as cultural technique for society and why. Also the danger of software patents will be discussed. 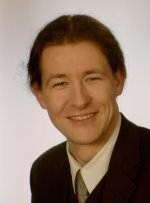 Bernhard Reiter has over 15 years of experience with Free Software. In 1998 he earned a Diplom in Applied Systems Science from the University of Osnabr�ck and went to the USA in 1999 as a research assistant. During this stay Mr. Reiter earned a Master of Science in Geography from UWM Milwaukee. He is co-founder and one of the managing directors of Intevation GmbH, a pioneer Free Software company in Osnabrück. www.freegis.org was co-started by Mr. Reiter as well as the German Grass User Association. From May 2000 to July 2003 Mr. Reiter was Vice President of the FFII. Since 2001 he coordinates the German section of the Free Software Foundation Europe.